Susan D. Page currently serves as Deputy Assistant Secretary of State for the Bureau of African Affairs. Prior to this assignment, she was Regional Director for Southern and East Africa at the National Democratic Institute. From 2005 to 2007, she served as the Director of the Rule of Law and Judicial System Advisory Unit at the United Nations Peace Support Mission to the Sudan. From 2002 to 2005, Ms. Page was the legal advisor to the Intergovernmental Authority on Development Secretariat for Peace in the Sudan. Prior to that role, she served as Senior Legal Adviser and Chief of the Justice and Human Rights Unit for the United Nations Development Programme in Rwanda. Ms. Page served as a Foreign Service Officer from 1993 to 2001, working as a Political Officer in Rwanda from 1999 to 2001 and as a Regional Legal Adviser for USAID in Botswana (1995-1998) and Kenya (1993-1995). Ms. Page began her career at the State Department in 1991, where she served as an Attorney-Adviser for Politico-Military Affairs in the Office of the Legal Adviser. Ms. Page received an A.B. from the University of Michigan and a J.D. from Harvard Law School. Full text of announcement is here. 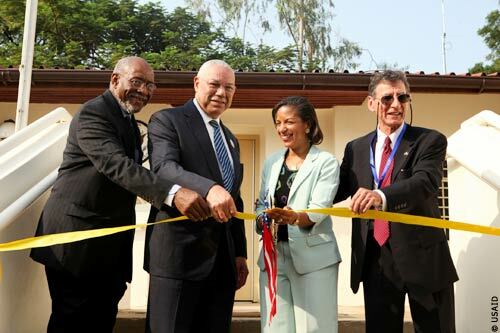 are Johnnie Carson,Colin Powell, Susan Rice and R. Barrie Walkley.